Arriving into Dublin in the late afternoon sunshine was the perfect start to our trip. We boarded the airport shuttle bus into the city, passing the much reduced North Wall Yard on the way. From the top deck, we were able to get a quick glimpse over the high wall, and noted an 071 Class locomotive on a liner service (most likely having just arrived from Ballina), and ex-IE Mk3 coach (number 7158) awaiting transfer to Kilmarnock for refurbishment. These coaches are to be used on the Belmond luxury train service in Ireland starting from summer 2016. As it was now rush hour in Dublin, the roads were very heavily congested, so we alighted at The Point and took the LUAS through the city streets. As a pre-event welcome evening, the majority of the group had a meal together in the excellent Nancy Hands Bar & Restaurant just outside Heuston station. This gave everyone a chance to get acquainted and swap stories of railways past & present. 11 of our group met by varying modes at Blackhorse on the LUAS (not to be confused with Blackrock on the Dart line south of Dublin - those present will understand this reference). The final member made his appearance at the Depot gates! We took the short 15minute walk through to the security gates of Inchicore Depot, where after being signed in, we proceeded across to the Training School and met our first host - Tony Kavanagh, Fleet Technical Support Manager for Iarnród Éireann. A brief overview: Inchicore Works was opened in 1846 by the Great Southern & Western (GS&WR) Railway. The total land covered by the works stretches to over 72 acres. At its peak, over 2000 men were employed within the site. 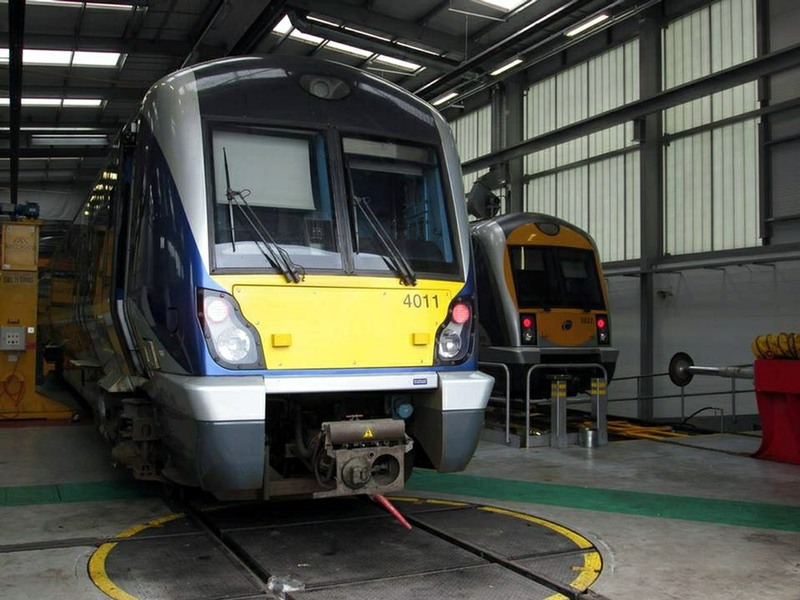 It justifiably holds the position as the main depot for Iarnród Éireann, maintaining a large fleet of locomotives and diesel multiple units. In glorious sunshine (a theme for virtually the whole trip), a most generous welcome to our group was given by Tony. This was then followed by a very informative presentation on the differing fleets operated by Iarnród Éireann, as well as some information on the different routes operated across the country. Coupled to this, we looked at the various maintenance facilities throughout the Irish Republic. 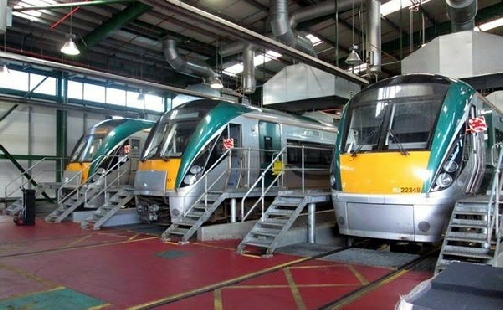 These are located as follows: Fairview EMU Depot (for servicing the EMU DART fleet); Connolly Depot; Heuston Depot (not currently used); Inchicore Works (the largest maintenance facility in Ireland); Laois Traincare Facility; Drogheda DMU Depot (for servicing of the 29000 units and ICR sets); Cork Depot & Limerick Wagon Works (the latter two locations also dealing with the 2600 & 2800 fleet DMU's respectively). 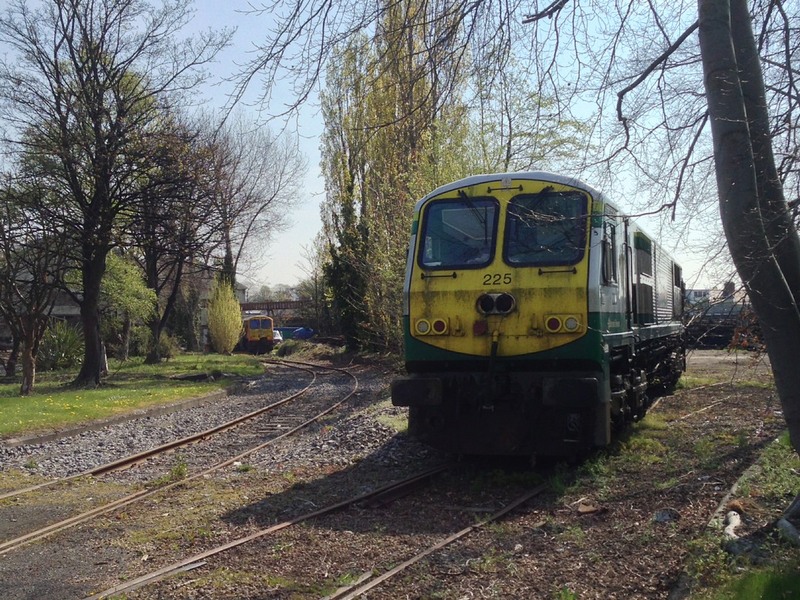 Maintenance of the "De-Dietrich" sets for the Dublin to Belfast route is shared between IE and NIR. These sets are jointly owned by the two companies, with the odd numbered vehicles belonging to IE and the even numbers being owned by NIR. 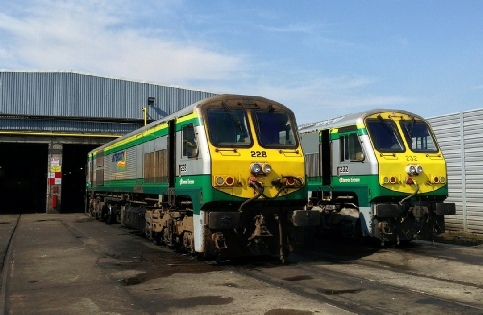 These trains are currently undergoing a major refurbishment programme which is being carried out at York Road Depot, Belfast. The excellent presentation went on to include a full run-down of the different multiple units and locomotives used for daily passenger & freight services. In terms of age, the train fleet in Ireland is relatively young, with virtually all passenger services operated with post-2000 stock. The only exceptions being the first series of 81xx series DART EMU's dating from 1983 and the 2600 DMU's which entered service in 1994. Local and suburban services are operated by a mix of DMU and EMU sets (dating from 2000-2003), with Intercity services operating with either 2007 generation 'Rotem' Railcars or MK4 loco-hauled stock built in 2004-05. The 22xxx series Intercity Railcars were built by Rotem in South Korea (dating from 2007). A total of 234 vehicles make up the complete fleet and were originally formed into 3 & 6 car sets. These have progressively been altered to 3, 4 & 5 car formations to better meet the passenger loading requirements. The newest suburban trains are the 29xxx units built by CAF in Spain in 2003. The fleet consists of 116 vehicles in fixed 4-car sets. These operate mainly to/from Dublin Connolly station. The slightly older 2600/2700/2800 Class DMU's work regional branch line services and are based in Limerick & Cork for most of their duties. The single car 275x units have been stored at present. Currently, only two classes of locomotive remain on the operational books of IE, these being the 071 & 201 Classes. 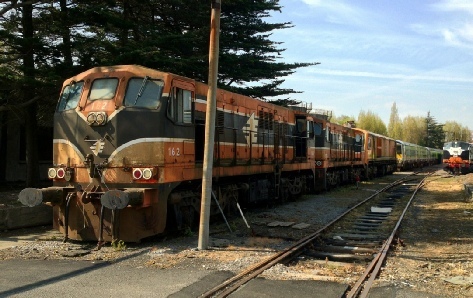 The former being used solely on ballast and freight work, with the later operating both passenger (Dublin Connolly to Belfast Central & Dublin Heuston to Cork) as well as freight trains. The De-Dietrich fleet which operates on the Belfast services have recently seen the addition of a Mk3 Generator Car into the formation. These vehicles were previously used on other locomotive hauled trains, which have now been replaced by Rotem Railcars. The inclusion of this vehicle negates the need for the train locomotive to provide Head End Power (HEP), which has dramatically reduced fuel consumption. To highlight the issue of fuel, the train locomotive would have been required to be in the equivalent of full power (904 revs per minute) even when standing still in the platform just to provide the required HEP. Tony was also keen to point out that Irish rail-freight (often in recent years thought to be the poor relation), is making a comeback, with a distinct increase in the amount of services currently operated. This includes timber traffic from Ballina and Westport, and the liner services operated on behalf of DFDS. The Zinc trains from Tara Mines (on the freight-only Navan branch) still run regularly to North Wall Yard at Dublin. Sadly, the infamous Guinness and sugar beet services no longer run! 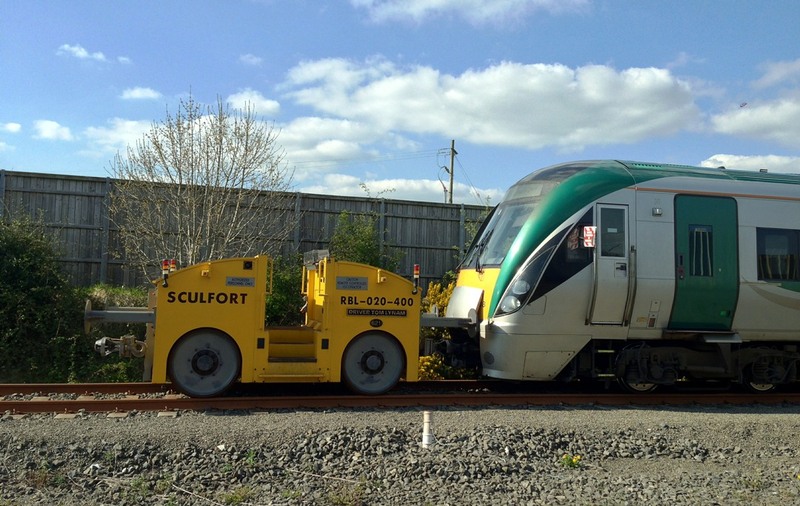 We were then given a short demonstration of the NEXALA Train System used by Iarnród Éireann. Primarily used as a 'one point stop' for all matters pertaining to the train (diagrams, daily duties, known faults etc,), this system can also be used to monitor the in-cab controls and the performance of the driver in a training scenario. A live view is also available, which enables someone to watch how the train is being driven and even shows which controls and devices are being operated. It is also possible to 'rewind' the data for investigation purposes; such as fatalities, near misses & operational incidents etc,. The next port of call was into the Simulator Suite, where we met Alan Coughlan (Simulator Trainer). Here we were given a brief overview of the differing fault & operational scenarios that can be used in the training/refreshing of drivers. 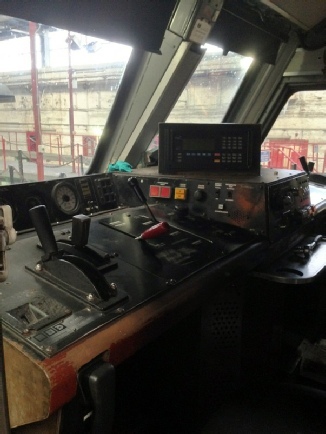 There are different simulator rooms for Locomotives & Railcars. It was now time to venture out into the depot itself. The first building we came to was the former Diesel No.1 shed - now known as the Bogie Shop. Here we witnessed two of the 071 Class locomotives undergoing a traction motor and bogie change. 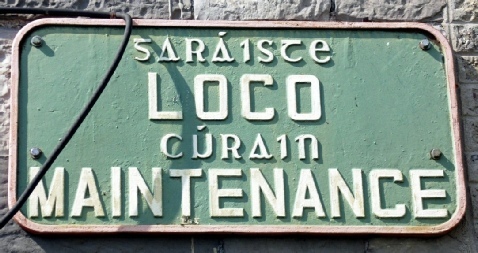 This work is contracted out to Associated Rewind, yet is carried out at Inchicore. A significant amount of spare bogies are also kept here, so that a rolling programme of changes can be easily undertaken. 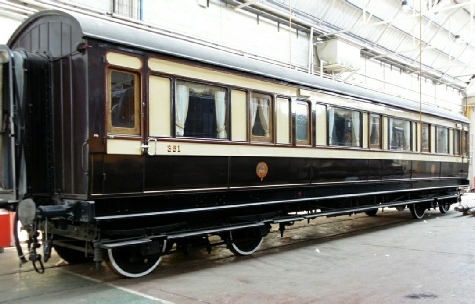 Inside the next building, entitled Fleet Casualty No.2 was the former State Presidential Coach - number 351. This vehicle dates from 1902 and has been painstakingly restored to its former glory, complete with GS&WR body side crests. The Railway Preservation Society of Ireland (RPSI), who undertook this work, have been awarded the Supreme Champion Award by the Railway Heritage Association. The next highlight was to take a guided walk around the outer extremities of the depot, where a large amount of stored/withdrawn stock & locomotives are stabled. With the introduction of new railcars, plus a downturn in the economy, many of the smaller class locomotives have been withdrawn and scrapped. Several of the 121 & 141 "Baby GM's" (dating from 1960) are still retained here, with thankfully a handful saved for preservation. Even the more modern 201 Class locomotive didn't escape the cull, with most of the non push-pull equipped engines being put into storage. Sadly, some will never run again, despite only dating from 1994. At the time of our visit, 5 daily diagrams exist for locomotive hauled trains on the Dublin to Cork route, although as signs of an economic revival appear on the horizon, this may increase. In conjunction with this, several of the Mk4 coaches also in storage, may yet see passenger service again. As well as the many stored items of rolling stock that still belong to IE, there are a few that are now in the hands of preservationists. 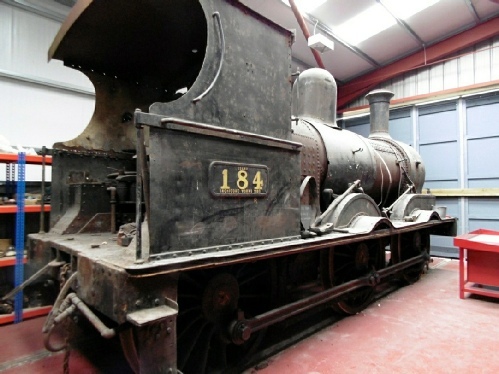 Locomotives 134, 141 & 175 are owned by the RPSI, with several of their 'Cravens' coaches here also. Additionally, a further five small GM engines are still here pending a decision on their future (144, 147, 162, 171 & 177). Walking behind the paint shop, which housed an 071 locomotive receiving its new colour scheme, we came to the current Diesel Shed. No less than five different liveries were visible; the most noticeable being the new Enterprise livery 'partially' applied to 206. 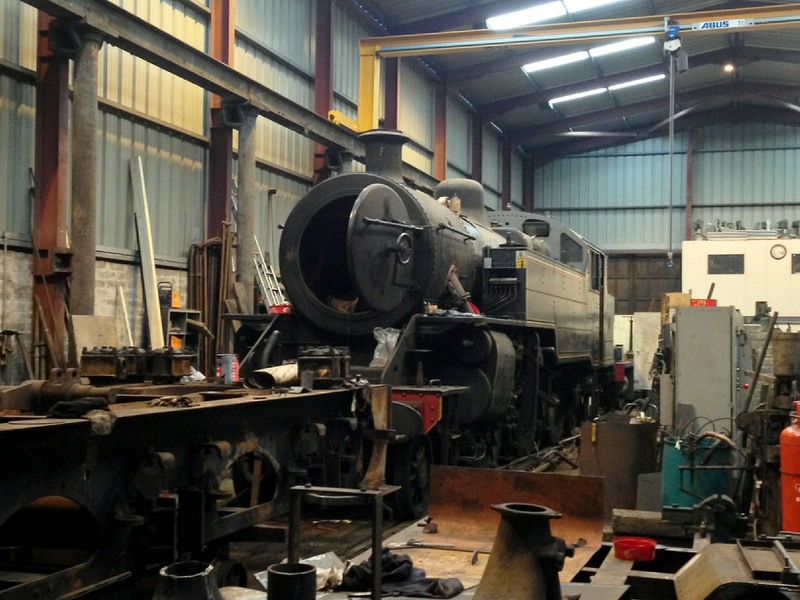 In addition to daily servicing, the heavy maintenance takes place here, and some serious reconstruction work was being carried out on fire-damaged loco, number 230. All too soon it was time to conclude our visit, although for a final treat, we were shown inside one of the reception buildings which houses’ a scale model of Inchicore Works. Arriving back at the entrance gates, we said our farewells to Tony, and concluded our first excellent visit of the trip. 60 minutes later, members re-grouped at Heuston station to board the 13:00 Intercity service to Portlaoise for our second visit of the day. This is one of the loco-hauled diagrams on the Dublin - Cork route, with GM 233 doing the honours at the front of the train. Arriving into Portlaoise we transferred to the waiting taxis for the short ride to Laois Traincare Facility. Upon arrival we were met by Neil Dinnen (Intercity Fleet Controller) who gave us a safety brief on the depot, before presenting us with a fine buffet lunch. The talk over lunch was of railways (do we ever discuss anything else?) on both sides of the Irish Sea. Suitably refreshed, we then met up with Sean Cain (Heavy Maintenance Technician) who along with Neil would be our afternoon hosts. 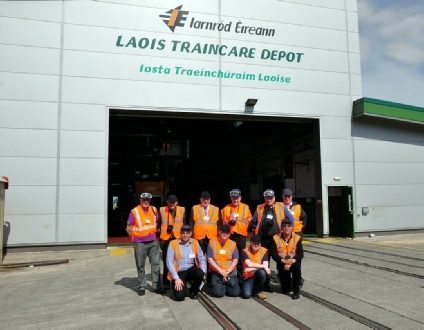 The Laois Traincare Facility was built in 2008 to cater solely for the new Rotem Railcars purchased by IE to replace the ageing locomotive-hauled trains. The depot has a 4-road maintenance facility (one of which has lifting jacks), plus a 5-road stabling yard, with a servicing slab and wheel lathe house adjacent to the mainline. Adorned with safety glasses and bump hats we were escorted through to the Depot Control Room where a comprehensive review of the daily procedures was given by Sean. 53 railcar sets are needed for traffic each day, with 54 being required on a Friday (out of a total of 63 sets). Laois Depot carries out A, B and Fuel Point exams, with Drogheda (north of Dublin) and Cork performing A and Fuel Point exams. Other depots, such as those at Waterford, Limerick, Heuston and Connolly carry out basic Fuel Point exams as required. An A exam is carried out every 48hours, with a B exam every 35days. The Rotem railcars have the same type engine as the London Midland Class 172 DMU's, with the exception being that the 22xxx have a hydraulic transmission, as opposed to a mechanical one. Every 16,000hours the engine is sent to LH at Burton in Trent for overhaul. Some staff from LH are based in Ireland too. Rotem also have some staff based at the depot too. At the far South-Western end of the facility is a building for stores items, with an assortment of larger stock on an adjacent hard-standing area. Here we saw wheelsets and couplers along with replacement cab surrounds. It was recently realised that the depot didn't have any such 'replacements', and so a mould was made from the cab of 22014 (during its own repairs) so that further spares could be made. Bogies and couplers are addressed during a B exam, and the purpose built depot has the capability of lifting an entire set in one move. Fortunately for us, set 22029 (undergoing a wheel change) was in the air at the time of our visit, so we were able to witness the 'flying train'. 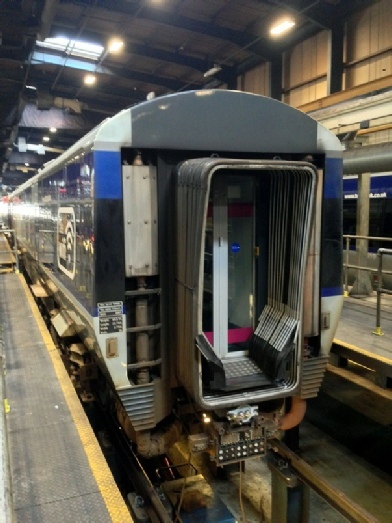 Air conditioning units are currently being replaced on the whole fleet of trains, with 2 units currently being changed per week. In regards to regular maintenance, there are three early arrivals into the depot – these being at 08:05, 08:30 and 10:20, with two further arrivals around lunchtime. 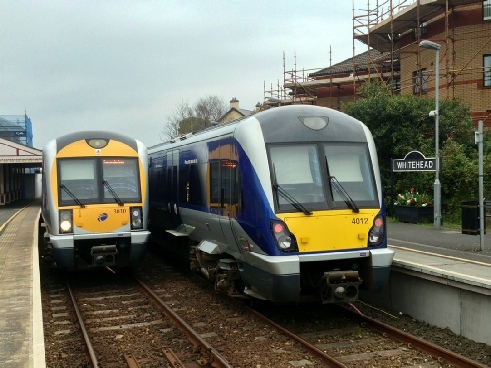 Sets also arrive from nearby Portlaoise station for their nightly exams off the 18:10 and 18:25 departures from Dublin, which run ECS the mile or so between the station and the depot. These are later followed by the 22:10 service, along with the 22:30 ECS working from Heuston. The wheel lathe is one of three in use on IE, with the one at Laois also used for 2600/2800 units if required. Units are hauled through the SCULFORT Wheel lathe by a small battery powered tug: number RBL-020-400 (621). It also carries the name Driver Tom Lynam after a former driver based in Portlaoise. 8 drivers are based at Laois, and cover the mainline route between Mallow and Dublin. Depot driving is carried out by CME staff. The driving cars are 1/2metre longer than the intermediate cars. The fuel tanks have a 1500litre capacity, which is sufficient for 2 days (or around 1000 miles). Each vehicle has one motor bogie and one trailer bogie. There are a total of 234 vehicles in the fleet, split between 3, 4 & 5 'piece' sets. Having now been fully re-formed, a programme of re-numbering will take place for ease of identity. However, this is currently awaiting approval from the Railway Safety Commission (RSC). Having concluded our second excellent visit of the day courtesy of IE, the group bid its farewells to our hosts, before returning to Portlaoise station. Some chose to take the direct Intercity service back to Dublin (with GM loco 233 again; it having been to Cork and back during our visit), whilst a small group opted for the local train via Newbridge to sample a 22xxx in action, especially now that we were ‘experts’ on them! An early departure from the hotel was required today, and our group made its way to the LUAS stop for the 06:30 tram to Connolly. 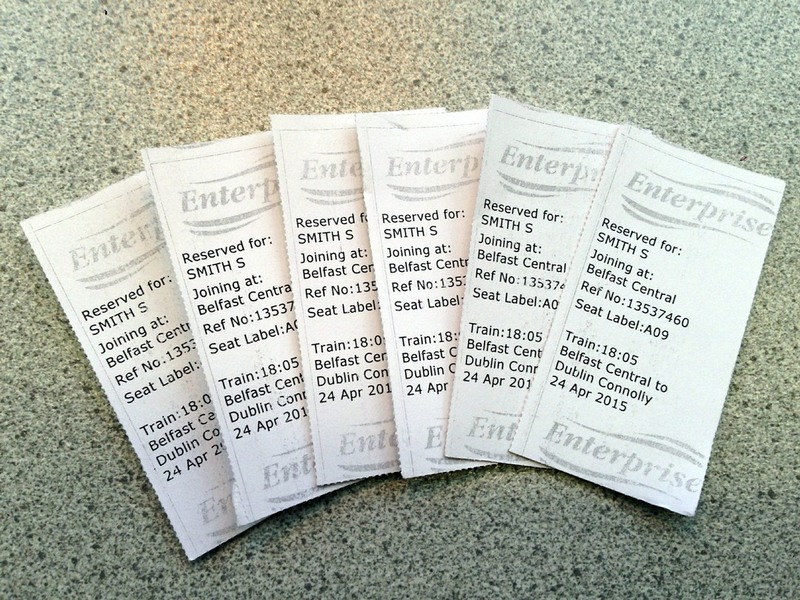 Here we had sufficient time to board the 07:35 Enterprise service to Belfast Central. Due to the current refurbishment programme of the De-Dietrich fleet, one of the diagrams is operated by an ICR 5-car set. As the set is crewed throughout the day by Iarnrod Eireann staff (NIR crews do not sign these units) it has to start and finish its duty in Dublin, and so is allocated to the first northbound departure each morning. With grateful thanks to our hosts at Northern Ireland Railways, the group had been reserved in FirstPlus Class for the journey. We all took advantage of the excellent catering services onboard and enjoyed breakfast in superior comfort whist enjoying the Irish scenery. Conversation flowed between rounds of toast, with subjects ranging from closed level crossings, quail map diagrams and 'poisoned pixies' from Swindon (those in attendance will understand). Crossing the border into Northern Ireland and the weather looked decidedly overcast. We wondered if the British weather would spoil our day? Arrival into Belfast Central was slightly ahead of schedule at 09:40, and by now the weather had improved. We changed platforms and boarded the 09:55 local service to Yorkgate station. Here we had a short 5 minute walk to the depot entrance, which included passing the site of the former York Road station which closed in 1992 when the cross-harbour rail link was opened. Once signed in at the security checkpoint we were met by Stephen McCaughey, Workshop Production Engineer, who gave us a brief introduction to Northern Ireland Railways. The main running shed here consists of a three-road facility, with each road capable of holding 3 units. Adjacent to this is the former diesel shed, which now houses permanent way track machines and a wheel lathe. At the top end of the depot complex is the workshop area which is located at right angles to the other buildings. 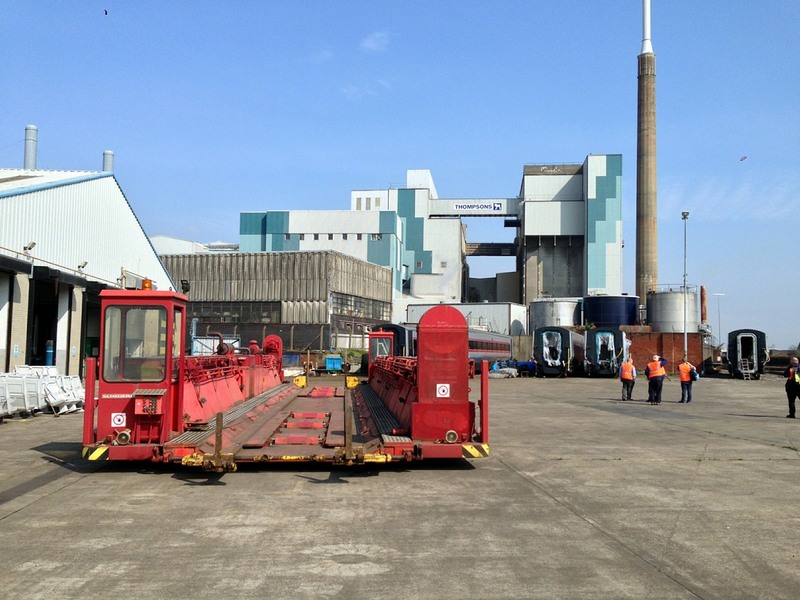 The actual "mobile transfer slab" is a rubber-tyred vehicle which moves independently between the transfer siding and the workshops. 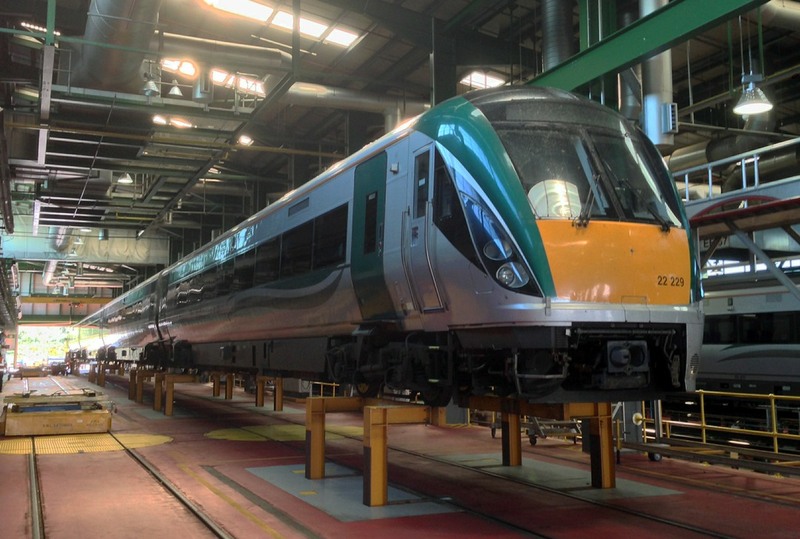 NIR have many similarities with their counterparts in Dublin; one of which is operating a modern fleet of DMU's. The 3000 & 4000 units were built by the Spanish company CAF in 2003/4 & 2011/12 respectively. Both units are similar in design, with only a slight difference in front end livery and shaping. 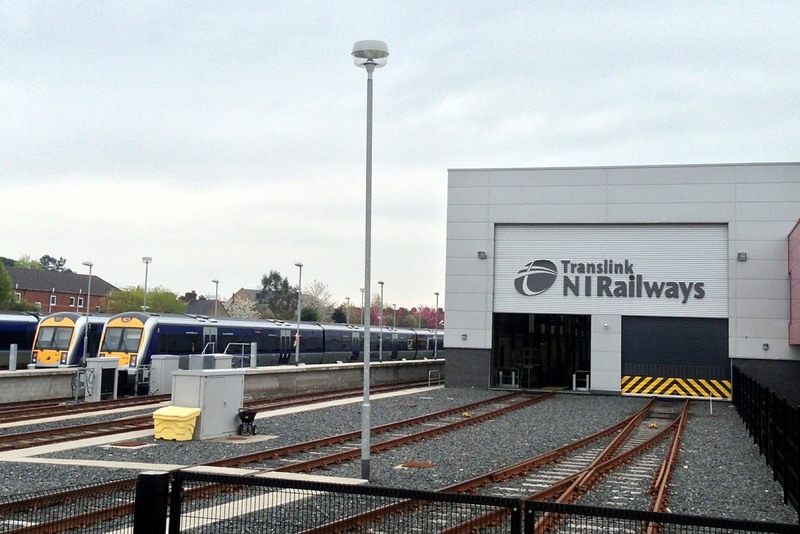 All of the trains are standard class throughout (there is no longer any 1st Class accommodation on trains in Northern Ireland), with the 3000 units having an extra toilet fitted. However, to make matters complicated, the different classes are not compatible in terms of electrical systems, and as such, cannot be coupled together. Sets 3001-3006 are additionally fitted with CAWS (Continuous Automatic Warning System) which allows them to operate in the Irish Republic, and thus can sometimes be found deputising for the usual Enterprise train, or used on 'additionals' to cater for demand. 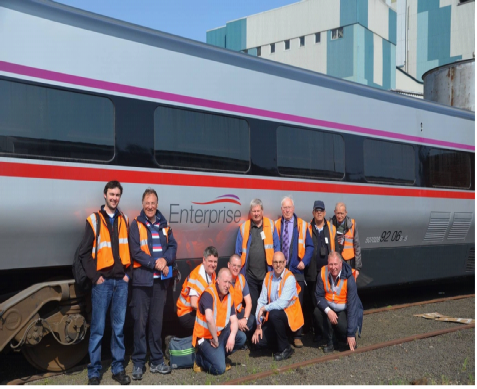 York Road is currently involved with the Enterprise refurbishment programme and is responsible for the coaching stock. 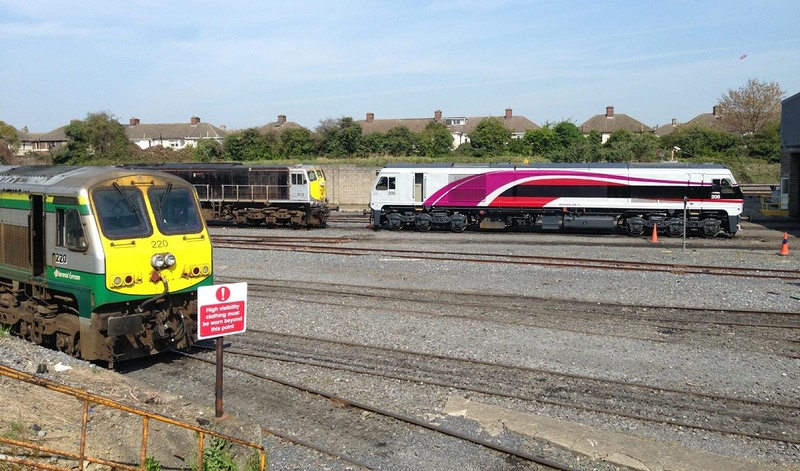 (The 201 Class locomotives are being dealt with at Inchicore Works). The work being undertaken is very comprehensive, and involves the replacement of battery chargers, seating, carpets, toilets, air conditioning units, the fitting of WIFI equipment, power sockets and CCTV. Some of the internal work is being undertaken at the nearby Fort William Train Depot. 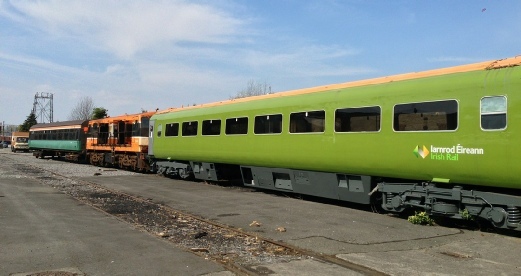 In addition, a new livery is being applied to the entire fleet of coaches and locomotives, and several vehicles were already carrying this colour scheme during our visit. York Road also houses the Sandite Train. 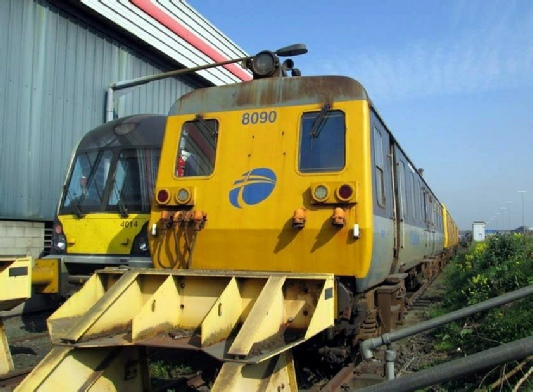 This is formed of withdrawn NIR '80' Class DEMU vehicles (numbers 8090, 8069, 8097 & 8094). The set is extensively used through the leaf fall season and is expected to remain in service until the end of next year, when a purpose built machine is acquired to replace it. 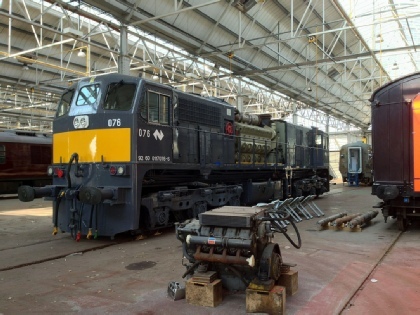 Also present on site were all three 111 Class GM locomotives (8111, 112 & 8113), of which 112 has yet to be renumbered. These are retained for engineering and ballast duties. Still in glorious sunny weather, we arrived at the very modern looking Adelaide Maintenance Facility. This purpose built facility was constructed to cater for the new 4000 units, as York Road & Fort William was running at or near capacity with the 3000 fleet. In stark contrast, the buildings here were modern looking and lacked the years of grime and oil which had taken hold of the old diesel depot visited earlier. Our guide for the tour was George Shields, (Depot Engineer). As with all our visits, a substantial amount of wheel sets, and spares, were located here. George explained that the bogies receive an overhaul after every 8000hours and a full rebuild after 16,000hours. For everyday service requirements, NIR need 37 units in traffic (out of 43 of total). In reality the 4000 units tend to work the shorter routes, with the 3000 units (with the extra toilet) working to Londonderry etc,. However, this is often not possible due to maintenance issues, so a fair amount of diagram changes will be required as a result. 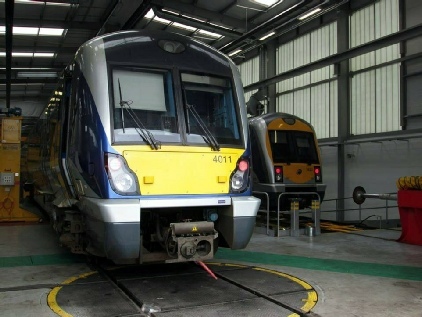 The diesel servicing shed has a unique feature, whereby its exhaust extractors pivot out from the walls to cover the DMU's exhaust pipes when they are running in the shed. The outer yard consists of four stabling sidings, a train wash facility and toilet tank discharge area. 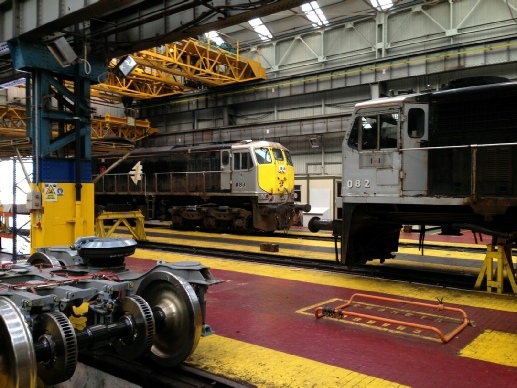 All train movements within the confines of the depot are undertaken by maintenance staff. Having departed from Adelaide, we again changed trains in Great Victoria Street before heading to Whitehead. The journey along the coastal route north of Belfast looked stunning in the afternoon sunshine, and also gave us time to eat our lunch. Transferring the short distance to Whitehead RPSI Depot was simple and we were greeted by Charles Friel (Museum Curator). A brief history of the Railway Preservation Society of Ireland (RPSI) was given: The Excursion platform dates from 1907, when additional capacity was required for the many visiting holiday trains coming from all over Ireland. Only one of the original brick buildings (along with an impressive water tower) survive to date, although the newer facilities have tried to recreate the style of what was lost. The Society was formed in 1964 and moved into their home at Whitehead Excursion station in 1966. The RPSI was not set up as a heritage line; the aim being to run on the NIR mainlines from the outset. Currently around 70 day excursions per year are operated. Most originate from its Whitehead base, yet some start in Belfast using a Mk2 rake of stock. For other trains that start in Dublin, a set of Craven coaches is based at Connolly Depot. An annual 5-day railtour is generally also organised, and takes in a wide variety of destinations, including some off-train options. Most trains in their programme are steam hauled, although a few are diesel-hauled (using IE 071 or NIR 111 Class locomotives) to cater for the more modern enthusiast. Santa specials are also run from both Dublin and Belfast in December. As a result of the 1980 Buttevant Rail Disaster, wooden-bodied stock was banned from the mainline, and as such, many of the RPSI's original coaching stock had to be withdrawn from use. From this date onwards, the society turned to cravens, and then subsequently Mk2 stock also. Fortunately, several of these 'withdrawn' coaches do still survive in preservation centres or museums; such as Whitehead or Cultra. Pride of place for the society is undoubtedly their stable of steam locos. Like most organisations, some are long-term restoration projects, and others have been saved because of their national importance (even though they are unlikely to run again). However, a few examples are currently active; including GSR K2 Class, No.461 (based in Dublin), GNR Q Class, No.131 (which moved under its own power for the first time in 50 years on 31/01/15) and GNR V Class, No.85 (owned by the Ulster Folk & Transport Museum). Also on site and next in line to return to traffic are LMS W Class, No.4 and GNR S Class, No.171, which spent time at Shildon, County Durham, before being repatriated back to Whitehead when restoration efforts failed to materialise. 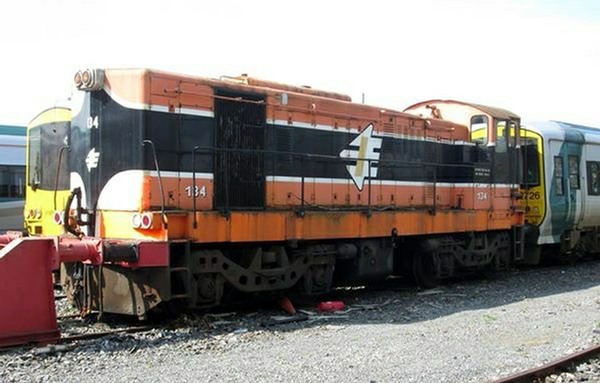 In the late 1970’s, RPSI steam locos, (No.184 and 186) were both painted into a fictional livery, based on the South Eastern Railway in England, for use in the film “The First Great Train Robbery” which was filmed at various locations across Ireland. 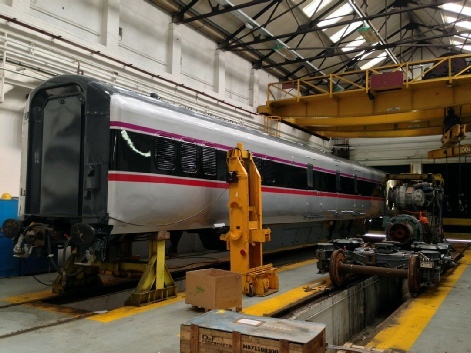 To aid other restoration projects, a supply of bogies have been acquired from the now-scrapped 80 Class DEMU’s, along with a further supply from the Mk3 coaches previously in use with Iarnrod Eireann. Like many preservations centres in England, a Mk3 sleeping car is on site for staff to use when staying at Whitehead. Number 26 (or ex-BR 10651) is so numbered as it follows on from the NCC series of camping coaches (1 – 25). It certainly looks resplendent in its LMS unlined Maroon livery. We were also escorted through the various carriage sheds, which housed a large assortment of rolling stock. Amongst those we saw were 5408 (a Mk2 vehicle) which was the final presidential state saloon used in Ireland. 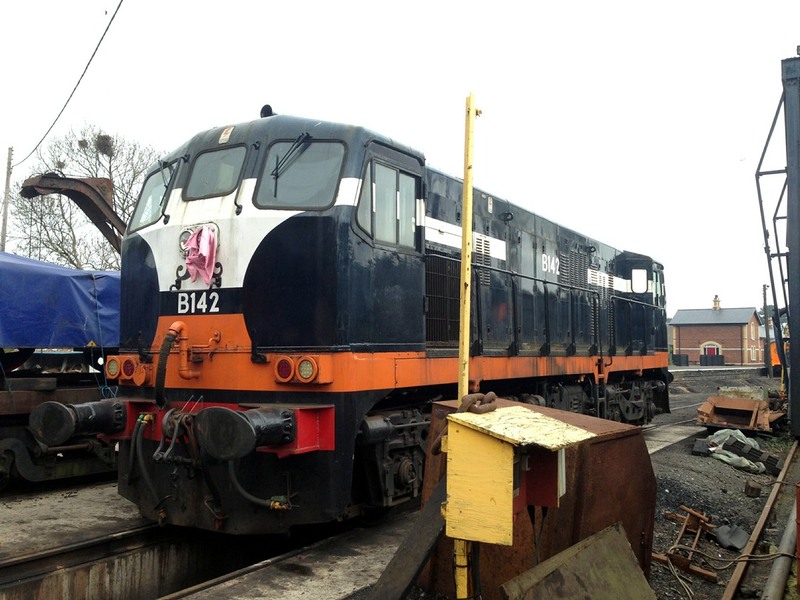 It was acquired by the RPSI in 2012 and moved from Dublin to Whitehead as part of the formation of the St Canice railtour in May 2014. Concluding our visit, we were shown around the perimeter of the site, with the grand plans for their new visitor centre being explained. Back at the Whitehead excursion platform, we were all given copies of an RPSI newsletter, and in return the members present gave a suitable donation to this very worthwhile organisation. We then took the local train back down the coast to Belfast. Returning to Dublin on the 18:05 Enterprise service (‘pushed’ by GM loco 207), we were again ‘upgraded’ to FirstPlus, and took advantage of the excellent evening meal service on offer. During the journey, the conversation, as usual, turned to all things railway, including Buddleia – “The National Flower of Network Rail”. Our final day arrived and the weather had distinctly turned. With several members having departed home the previous night, our group was somewhat reduced today. We made the short walk from the hotel to the nearby LUAS Depot at Red Cow. Here we were met by Dave Rooney, Specialist Operations Advisor for Veolia/Transdev. We were escorted through to the office suite where introductions were made. Following this, we were led into the workshop building which now contains 5 maintenance roads and a wheel-lathe road. The later also housed a small internal Unilok locomotive used to drag the trams through the lathe. The depot was initially built as a four road facility, but within just three years of opening required a 2-road extension to be built. 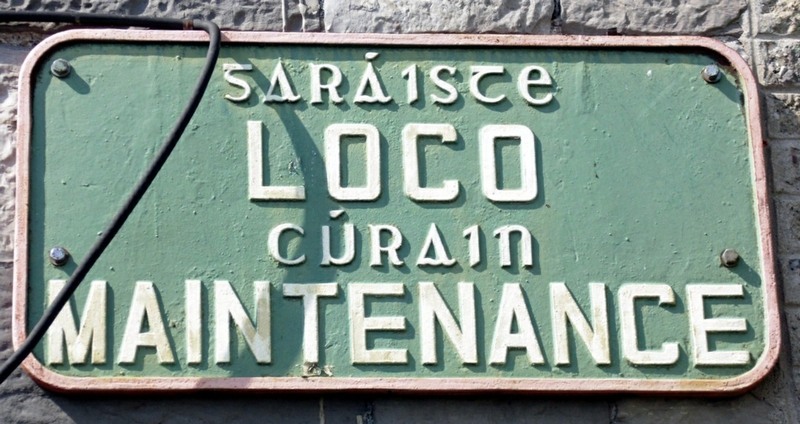 The LUAS system was opened back in 2004, and initially was met with much local opposition. However, this was short lived as its potential and practicality was quickly discovered. 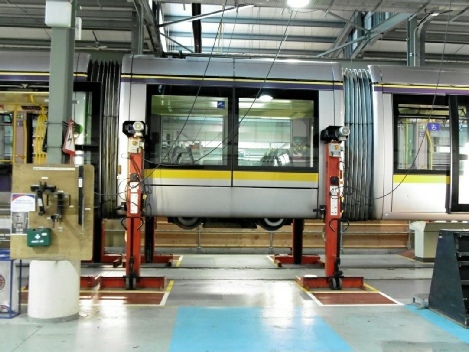 Red Cow is the main depot and operational base for the LUAS system, with a smaller depot also located at Sandyford. Approximately 230 operating staff are employed, of which 170 are drivers. Alstom have their own staff on site, and take care of the daily fleet maintenance at both depots. Currently the vehicles are going through their 900,000kilometre overhaul. The 3000 & 4000 series trams (dating from 2002/3) are known as "Citadis". Both of these sets now operate on the Red line (The Point to Tallaght & Saggart), with the newer 5000 series trams working exclusively on the Green route (St Stephen's Green to Brides Glen). The trams were delivered as 30metre sets, but quickly became overcrowded on most services, so a new 10metre section was added to bring the trams up to 40metres in length. The 'insert' is a suspended section without bogies underneath. 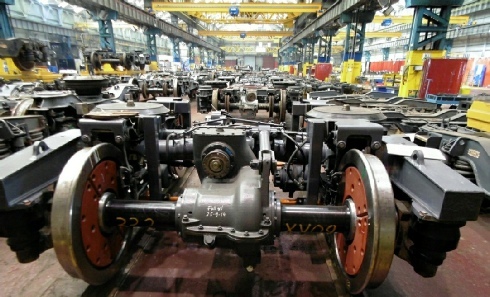 To enable the heavier vehicles to cope with the inclines on the route, one of the existing bogies was upgraded to a motor bogie to give extra power. A fully loaded tram can now accommodate around 300 passengers. Trams operate at a maximum of 30kph in the city centre, with 70kph being the top speed elsewhere. The system carries on average 80,000 passengers a day, with service frequencies of up to 3-4min in the peak hours. The original trams are 90% low floor, with a small 'step' over the motor bogies. The newer 5000 series are completely low-floor. Inside the maintenance building we were able to view a 3000 unit up on the jacks having bogie overhauls, and the opportunity was taken to point out some of the equipment located below the tram floor. This included the "body stopper", which is a device that is armed when it detects debris (or bodies) under the floor. After viewing this area, we were shown into the Control Centre which is staffed by two Traffic Controllers on a weekend (three during weekdays). 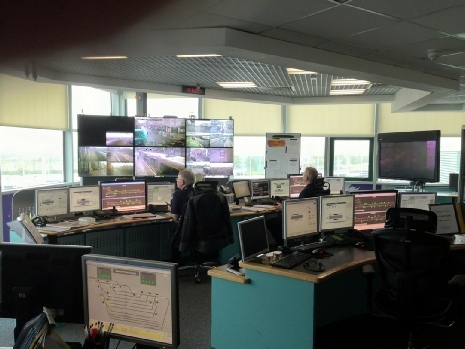 A full bank of monitors and display screens allow the controllers to oversee the entire network. Control of the station platform CCTV is also available from here, which can be useful for monitoring delays, passenger issues and other disruptions. Close relations with the Dublin police force is maintained via this equipment, and indeed, during our visit we witnessed an arrest live on the screens. Route display screens show both lines of operation, with train tracking facilities to show 'live movements' and any delays etc,. We were shown the Daily Service Sheets, which give details of all the trams in service on the day and which also lists those available as spare & on standby. Faults for those vehicles not in traffic are also listed. We now headed outside into the stabling area - just as the heavens opened. We quickly made our way inside one of the trams parked up nearby (number 3020). Once inside, and dry, Dave showed us the cab layout and explained the various operating controls and driving procedures. The cab confines are fairly small, and like most light rail designs have a full height glass screen behind the driver. Dave comments that as most current drivers are not from a 'heavy rail' background, they do not tend to have issues with the "goldfish bowl" design of their working environment. Like most modern train designs, a dual power/brake controller is fitted, although the most noticeable difference is that to apply the brakes, the controller has to be pulled towards the operator! We were now given a short ride up the depot (Storage Siding 8) to demonstrate the automatic and emergency braking systems on the train. We were instructed to be seated for this test - and for very good reasons too. Even at depot speed, the retardation was incredible, with virtually no wheel slide (it was now raining very heavily). The sanding devices and magnetic track brakes certainly seem useful tools for when operating in the busy Dublin streets. Having returned our tram to where it started, we made our way back to the depot buildings. 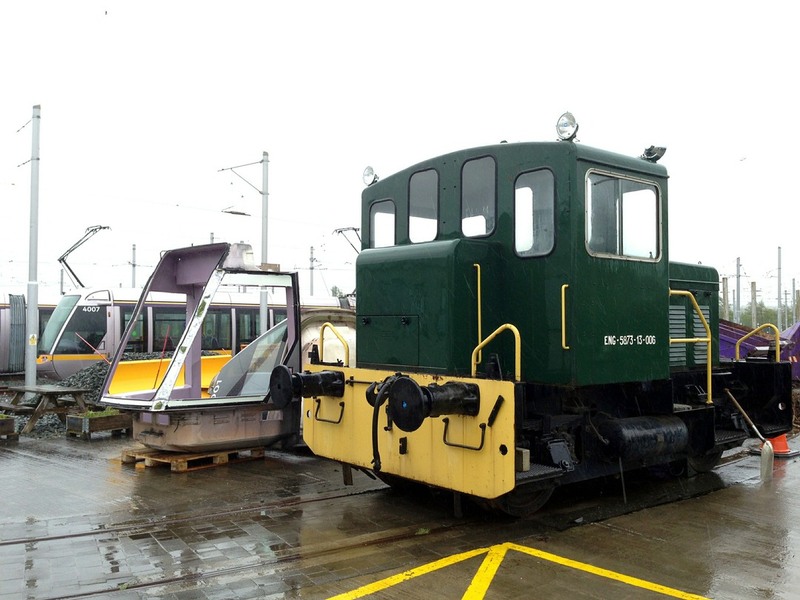 However, one last detour ensued, as we were shown the Alstom shunt loco which was one of two similar engines used in the construction of the LUAS system. Being standard gauge, the loco cannot be used on any other line in Ireland, and so is currently owned /stored by the Railway Procurement Agency (RPA) within the depot confines. Our time at Red Cow concluded with a visit to the staff canteen and a late morning coffee break. Here we said our final thank you to our host before heading off. Suitably armed with our newly acquired knowledge, the group then travelled into central Dublin to ride on the green line to Brides Glen and take a quick view into the second depot at Sandyford – not an official visit, but easily achieved from the footpath that runs alongside it. Back into Dublin a second time, and with the afternoon at leisure, it was decided to take a trip out to Galway. 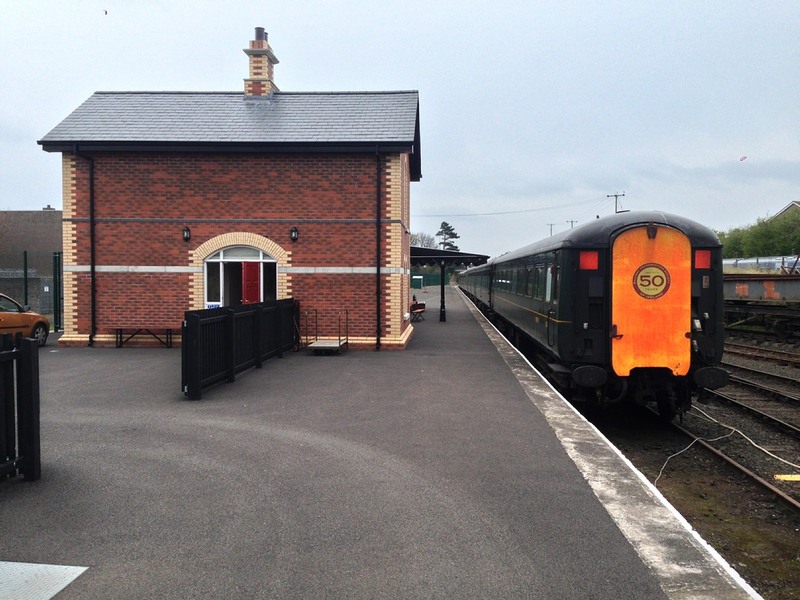 We boarded the 15:35 service, arriving just over 2hours later, and an unusual arrival saw our train enter the recently restored bay platform. Here we had just under an hour before our return journey. At Athenry, we opted to break the journey back towards Dublin to see the remains of this once important junction station. Little remains of the line that used to head northwards towards Tuam and Claremorris, although the line south to Ennis and Limerick still sees a fairly good service. Hopefully one day soon, Athenry will once again be the ‘crossroads of the rails’, if the Western Corridor Route is extended north. An added bonus here was the derelict station masters house and former signal box that have both been retained in excellent condition. Upon reaching Dublin, we made our final LUAS journey back the hotel at Red Cow to conclude an excellent series of visits. After a final breakfast, we took the direct shuttle bus to the airport, and as the plane took off and Ireland fell away below, it was pleasing to see Inchicore Depot in all its glory. You can probably guess we are in the Bogie Shop! 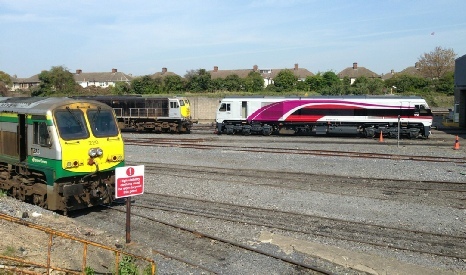 Three different liveries on view outside the Diesel Depot. 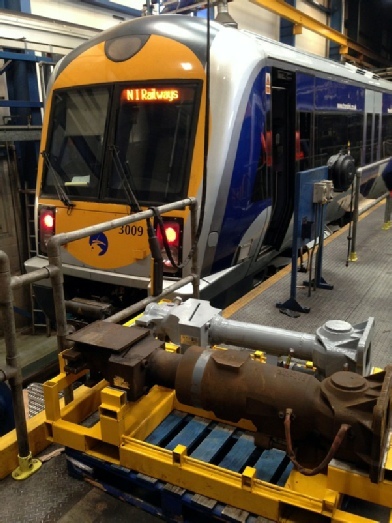 Unit 3009 undergoing a coupler change – (the smaller version for the intermediate cars and the larger one for the driving cars). Our visit coincided with the arrival of a 3000 unit which required 2 bogies to be changed. It arrived at 11am, and would have the required work carried out by on-site CAF staff, before being put back into traffic for the peak period later that afternoon. Having taken a full circle of the depot, we concluded with a close up look at some of the works being undertaken on the De-Dietrich fleet in the workshop and paint facility. Exiting the depot, we made our way by local NIR services (changing at Great Victoria Street) to Adelaide station, for visit number two with NIR. 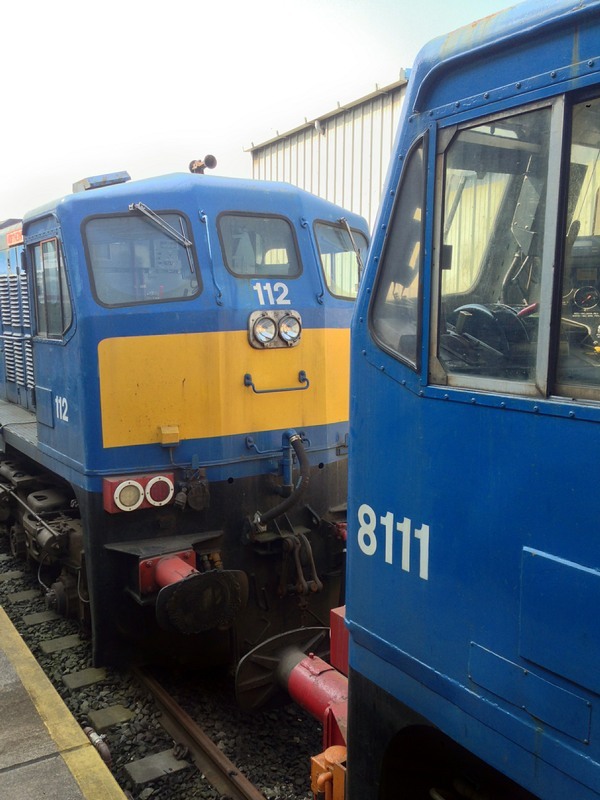 The only standard gauge diesel locomotive in Ireland?